The location is Swanwick in Hampshire, LSWR. This is strawberry harvest time and there is a line of LNWR stock. The nearest vehicle, part off-picture, is painted for Milk Traffic and may be no. 374. But the stock is mainly elderly looking passenger stock although it looke to be virtually ex-works. The query is: was it usual to use passenger stock in this way? The second door of at least two of the carriages has something painted or written on it so perhaps the stock has been down graded. As ever your help would be much appreciated. There is an article on Strawberry Traffic from the Railway Gazette that is scheduled to be reproduced in the LNWRS Journal. Here it states that Swanwick, Hants. was one of two main wholesale areas for strawberry cultivation and the Hampshire growers had their own well-known “chip” basket for the transit of the produce. Because of the delicate nature of the product and the basket, they could not be stacked on top of each other and therefore vans had to be fitted with shelves so that each could be placed side by side. This can just be seen in the van with the open door in the foreground. There is no evidence in the photo that the fruit was being loaded into the carriages. According to the article, the Hampshire fruit ripened first and, this being such a lucrative and competitive cargo with a limited season, it is possible that the train was made up at the start of the season to include “representatives” of the company going into the growing fields to secure all it was possible to obtain for the company's traffic. Later “working arrangements” were in place that removed this requirement which suggests the picture might be quite early and why the stock appears reasonably new. If you could forward me the image I will reproduce it in the Journal with the article. The six-wheeled LNWR stock (all third class) has recently undergone a works overhaul, evidenced by the white roofs. I don�t think it is in ay way being used for fruit traffic, the carriages are simply parked in the goods yard (lack of space elsewhere?) I am guessing that they have worked in with a troop special (perhaps to a summer Army reservists training camp) and are waiting until they return home again at the end of the week. The vehicle on the right appears to be an LNWR 25ft 0in Fruit and Milk Van shown on Page 136 of the 1895 Diagram Book, but supplemented 1910-15 and hence not shown in the 1915 Diagram Book, although some reached the LMS. They were built in 1888/91. I am guessing the date of the photo as 1906-1913. Would traffic originating on the LSWR have been consigned in stock belonging to another company? Perhaps the LNWR van is �on hire� to the LSWR at this time of peak seasonal demand. It can be seen that three of the LNWR 6-wheel carriages beyond the LSWR bogie van, have a legend painted on the lower panel of the second door in each case. This suggests to me that the three carriages were 'branded' for special use, such as the conveyance of fruit traffic. It is a pity that the legend cannot be read. The nearest 6-wheel carriage was probably branded as well, but the door in question is open away from the viewer. I agree that the LNWR stock has writing on it, but I am surprised that this relatively modern and recently overhauled 30ft 1in x 8ft 0in stock would be used for fruit traffic, which involved stripping out the interiors and fitting shelves. I would have thought that the older 32ft 0in x 7ft 9in stock would have been more likely to be relegated for this purpose. What a pity that the writing cannot be read! And again, why would traffic originating on the LSWR be consigned in �foreign� vehicles? The following magzine references from our bibliography relate to LNWR involvement in the strawberry traffic. We have all of them at the Study Centre. 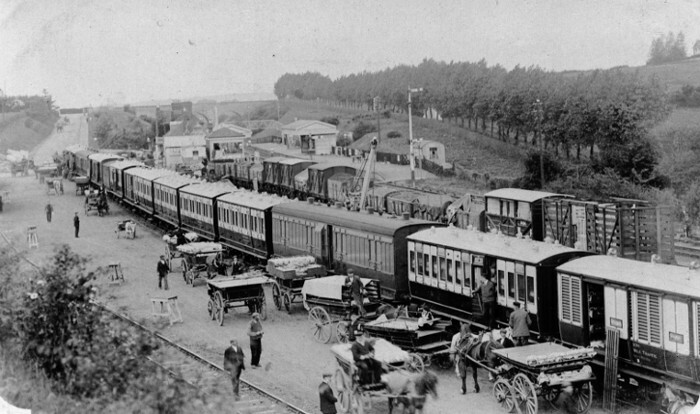 These indicate that LNWR vehicles were commonly used for this traffic.